This page focuses on the Great Northwestern state's fishing charters and guided fishing trip services. You will only find fishing charters and guides from Alaska here. Alaska Halibut Fishing - Exhilarating Alaska fishing charters for trophy salmon, halibut and giant lingcod. Master Guide Steve Zernia gives all out effort. Experience heart-pounding sportfishing action. A special breed of angler flocks to this nook of the world, where fishing lore is born. Every fisherman dreams of the day they can make the pilgrimage to this fabled Fishing Mecca. Let ProFish-n-Sea Charters take you into the ocean on a truly unique fishing trip. Alaska Fly In Fishing - Exclusive fly in fishing trips landing in different remote rivers and lakes to catch Alaska's famous migrating Salmon, Dolly Varden, Lake Trout, Grayling, Northern Pike and Trophy Rainbow Trout. Our lodge offers a wide range of optional fishing and wilderness trips. Consider us as a base of operations for remote fly fishing in the wilderness fishing on a day-to-day basis while still enjoying the luxury of our lodge. Alaska Bear Viewing - Bear viewing trips to Wolverine Creek and Katmai National Park. Unique up close brown bear viewing and photography opportunity. We offer a wide variety of options based from our lodge including fishing vacations, fly-out fishing, flight seeing trips, bear viewing and guided hunting expeditions. 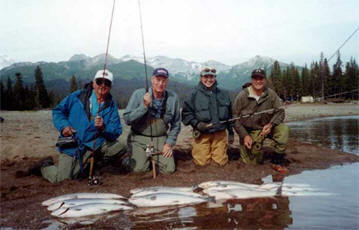 Alaska Fishing Lodges - Fishing lodge, custom fly-in fishing trips at our affordable deluxe full-service river lodge. All salmon, rainbow trout. fly fishing specialists, personalized fishing lodge vacations. Wilderness Place Lodge focuses on keeping the small up-close-and-personal approach unlike many larger fishing resort environments. We take pride in our many return guests; our lodge "family of friends" from around the world.